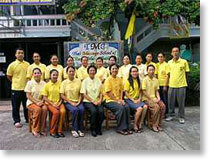 (300 and 600 hours program; Thai Government Certified Professional Massage and Teacher Training). Each course takes 10 weeks. Classes will be in English language. If you have completed Level 1,2 or 3 with TME or any other TMC authorized teacher, this will be recognized at TMC Thailand and you can proceed with further courses.